At twenty-five, Charlotte Rippon lived a life of utmost propriety while yearning for adventure outside the confining boundaries of her English village. Yet even she had no idea what Fate had in store for her when she rescued a badly-wounded man from the wayside and took him home to Rippon Manor. Nursing the stranger back to health, Charlotte is overwhelmed by feelings she barely understands. Alexander was a mysterious stranger, whose seeming inability to speak English concealed a desperate mission to save his shattered homeland and bring freedom to his people. 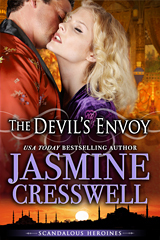 Held captive by one of the Sultan’s advisors, Charlotte found herself a veiled prisoner hidden amid the sensuous pleasures of the harem. Only Alexander could save her. A prince fighting to save his people, he demanded her passion, but Charlotte wanted so much more: she wanted his love!